A team at NNSI is conducting a research project to examine how Global 500 Fortune Corporations implement Corporate Social Responsibility (CSR) programs and form partnerships with nonprofits and government agencies to help relieve the global refugee crisis. 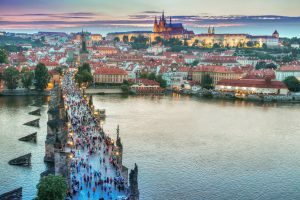 In the recent International Communication Association Conference (May 2018) which took place in Prague, there was a related study that applies a different perspective to analyze the global refugee crisis and how nonprofits play a significant role in refugee settlement. This study was titled “Communication Touchstones: The Cycles of Emotion in Human Service Work with Refugee Women Experiencing Intimate Partner Violence,” and it was conducted by Ariana Hernandez from University of Denver, and Patricia Geist-Martin from San Diego State University. They point out that one significant challenge refugees face when settling into the U.S. is the prevalence of intimate partner violence (IPV), and thus many outreach organizations have been established to help refugees cope with their violent experiences. Human service workers, who work at these organizations engage in a unique type of work as they communicate through emotions with clients. Through 12 qualitative interviews, the researchers examined the cycle of emotions workers experience as they communicate with refugee women who experience IPV. They found that workers utilize their communication touchstones (which consists of different processes of connecting, rebooting, and shielding) to navigate through challenges, emotional impulses, emotional labor, and emotional residue. This study helps our understanding with the global refugee crisis as it brings a unique perspective to highlight the microlevel complex processes of managing refugee settlement. It resonates well with our finding from the NNSI project that refugee relief effort spans sectors. In addition, it shows that refugee settlement is more than just about cultural integration but also issues related to mental health.